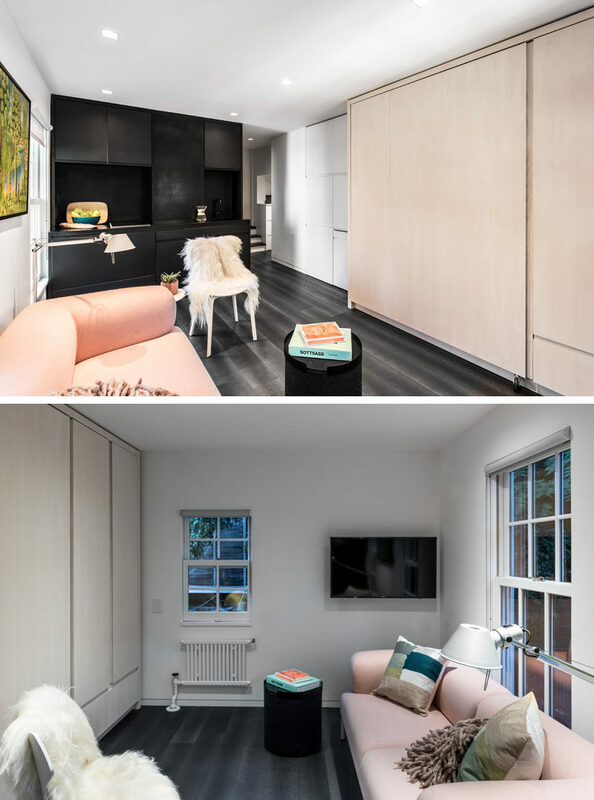 Architecture firm MKCA have recently completed the design of this small 225 sq ft (20 sqm) apartment in New York City, that features a wall full of multi-functional cabinetry. The apartment is essentially made up of three spaces, a small entry space, a main room, and a bathroom. 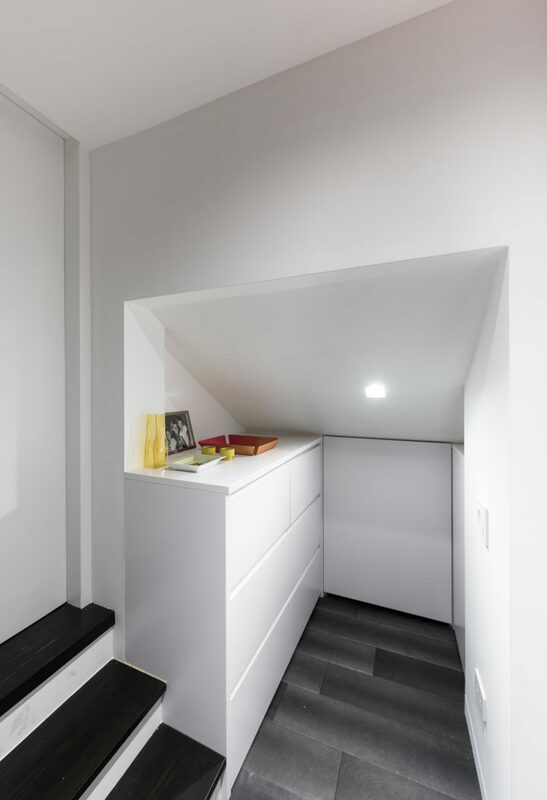 Here’s a look at the small entry space that houses a cabinet with storage, a must have item when designing such a small space. From the entry way, you immediately enter the main room. This space is home to the kitchen, dining area, living room, and bedroom. 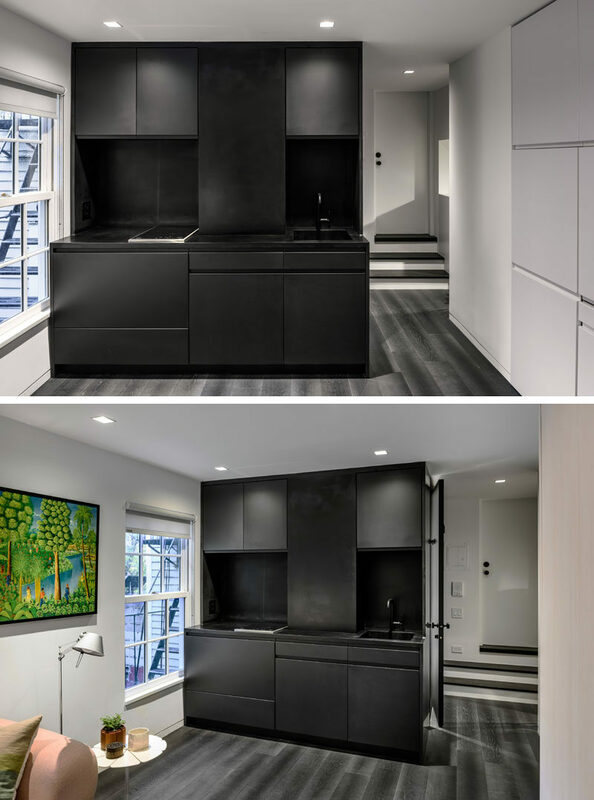 The black kitchen is the only dark space in the entire apartment, and it has a compact design with a small sink and a tiny cooktop. The designers have maximized the amount of cabinets by having them go all the way to the ceiling. Next to the kitchen is the living room and the wall of cabinetry. From these photos, you can really get a sense of how small this apartment actually is. Let’s have a closer look at what hides within this wall of cabinets. There’s a pull-out dining table that also doubles as a desk. Just above the pull-out table there are two cabinets, one is home to a small pantry, and the one next to it is home to a computer. There are multiple closet and storage spaces. 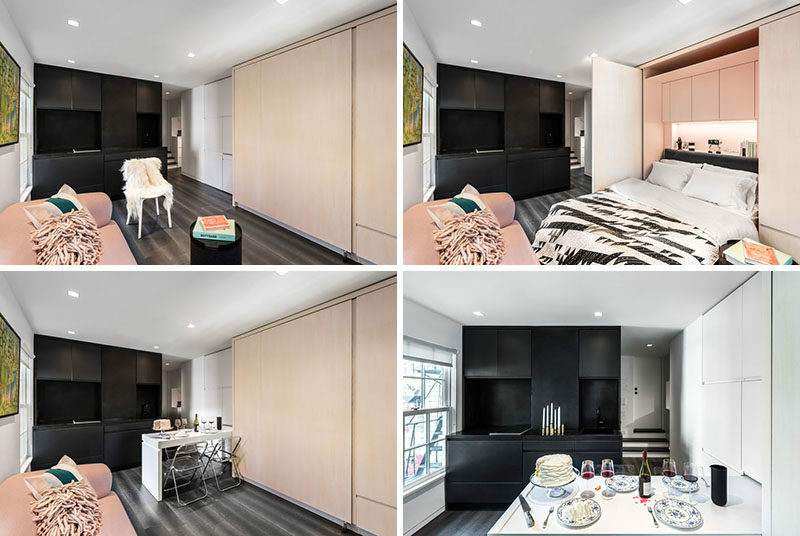 One closet has a mirrored door, there’s a small area for storing books and other personal items, and below that is a second closet with a bar for hanging coats, shirts, and pants. A major component of the cabinets is the wooden section that’s home to a bed. The bed folds down to reveal a headboard and even more storage space, as well as hidden lighting. Of course, the tiny apartment also has a bathroom. It’s located behind the kitchen, and has a small walk-in glass enclosed shower. 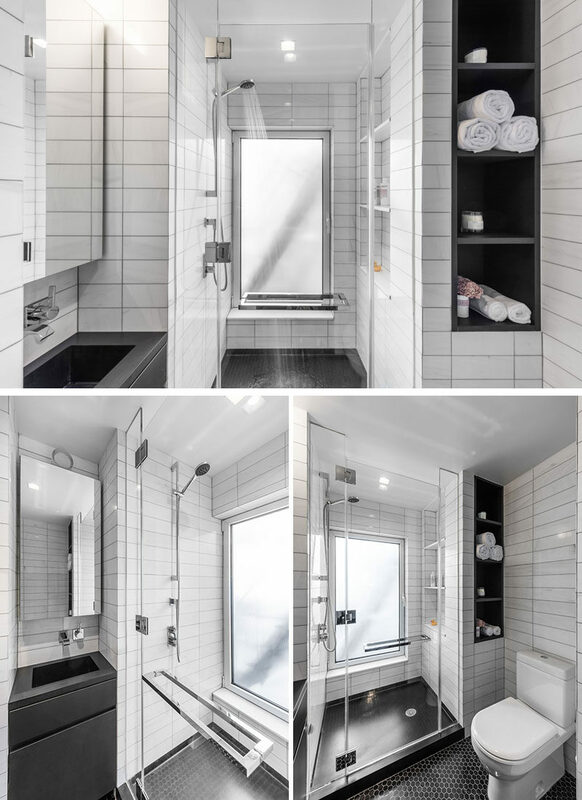 White tiles have been used to keep the bathroom feeling spacious, and black open shelving adds some additional storage to the small space. 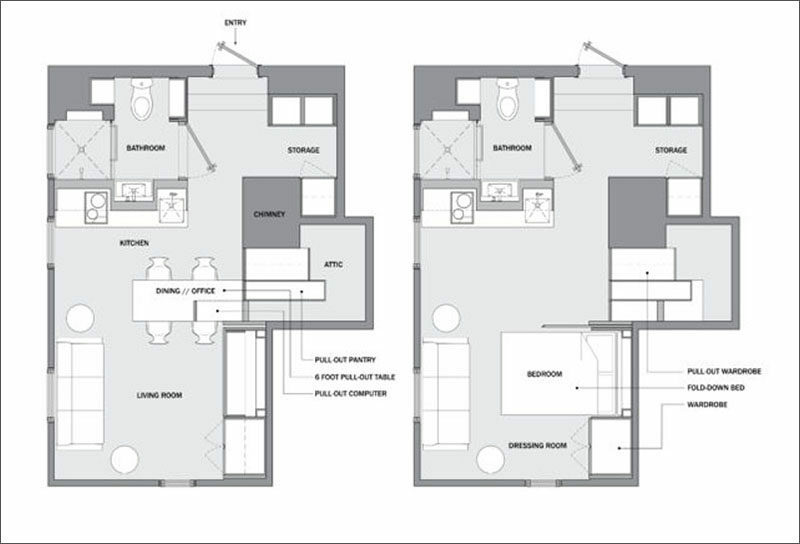 Here’s a look at the floor plan of the apartment, that shows the exact layout and functions of everything.